I'm one of those people who goes into a store, knowing exactly what I want... but you see, that's not always a good thing, because often times, the store doesn't have exactly what I want. As I was pulling together my themed decor for this month (after putting away my Easter decor! 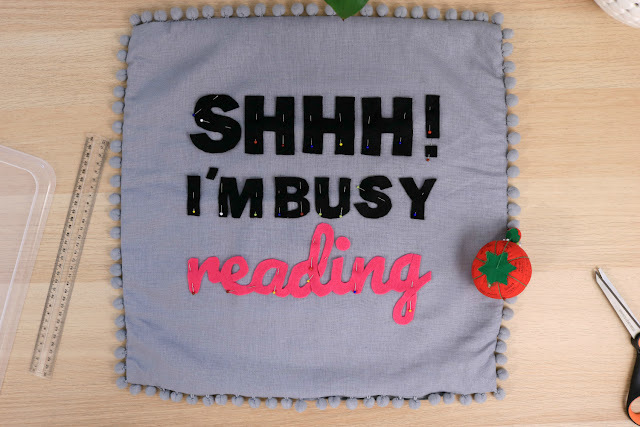 ), I decided I wanted a book related pillow. 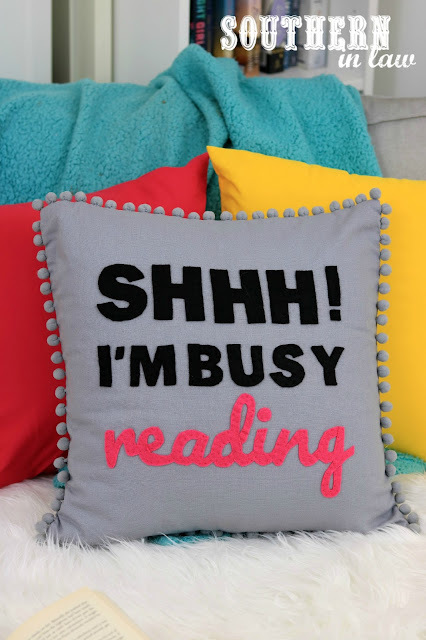 Something to add to my reading chair that was totally "me".... but do you think I could find it?! Nope. What I did find, however, was a plain grey pom pom pillow that I loved - but felt was too plain... and then it hit me. 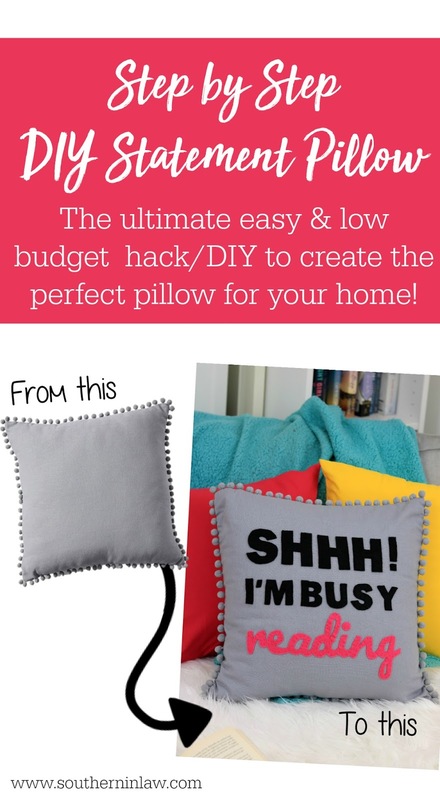 Why not take the plain pom pom pillow and turn it into a statement pillow myself? And thus I got to work. First, you need to get your pillow! You'll want to find a pillow that has a removable cover (one with a zip is best - but not mandatory) as you'll need to take the cover off. 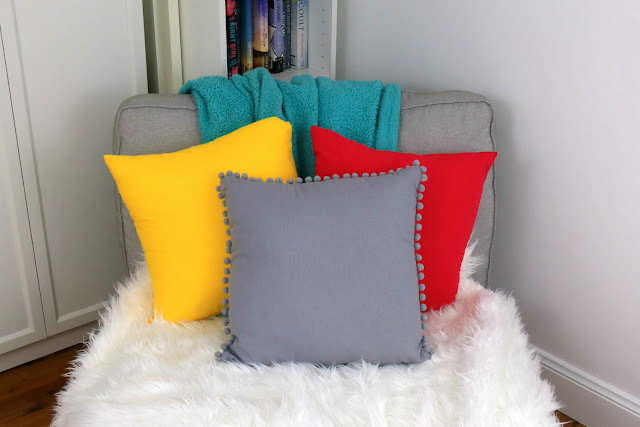 I picked up a simple grey pom pom cushion from Target for $15. 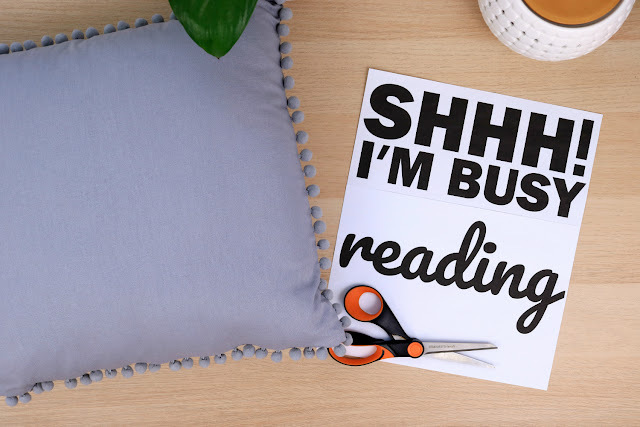 Once you've got your paper template, check to make sure it's the right size for your cushion and cut it out! 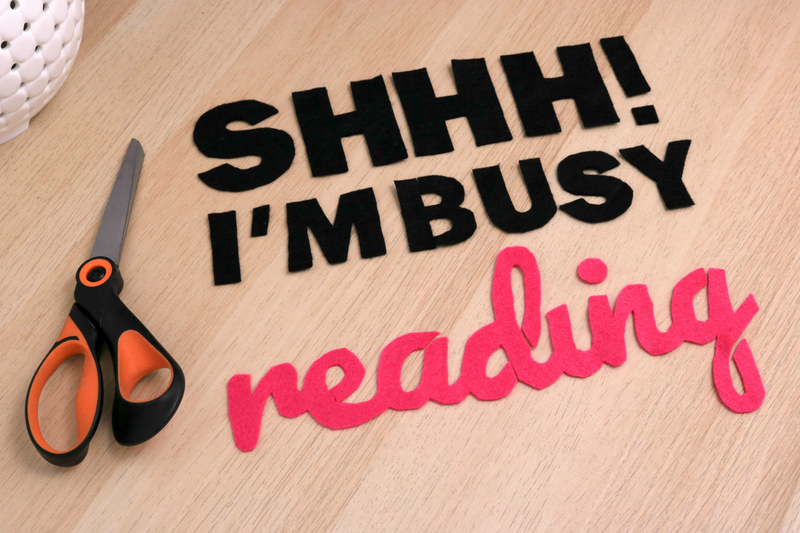 Once your template is cut out, pin it onto your felt, ready to cut the letters/shapes out. 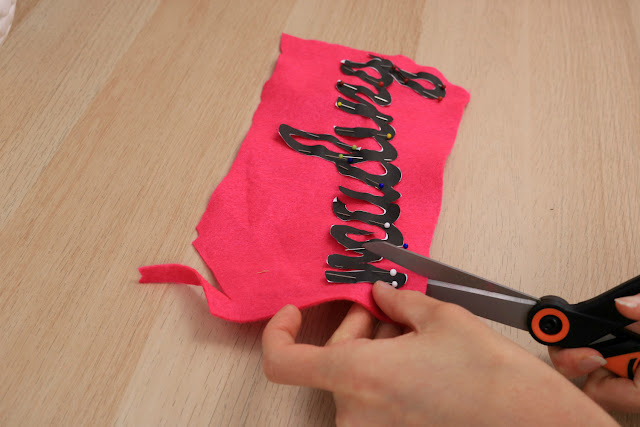 Carefully cut out your felt letters using a sharp pair of fabric scissors. I find you get the cleanest cut if you cut with the word facing the correct way to you (so the front side is facing you as shown). Repeat until all of your letters are cut out. 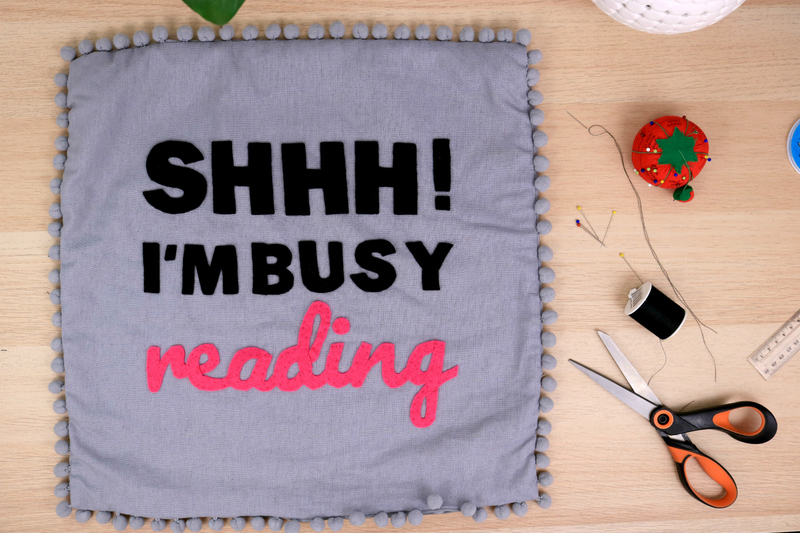 You'll notice I cut the e/a/d/g letters because I was struggling to cut the holes correctly - don't worry if you need to do this as you'll sew them back together later! Once you've got everything cut out, it's time to get pinning! Take the cover off your pillowcase and pin the letters/design in place. I used a ruler to make sure my letters were straight. Hot Glue Gun - this works, however, I find that if you use a lighter coloured felt (say white, cream, yellow etc), you'll see the glue behind the felt) and it may not sit as nicely as it does when stitched. Fusing Tape/Mending Tape - As I used on this DIY Fabric Wall Hanging Tutorial, this iron-on mending tape is great for attaching fabric to fabric. 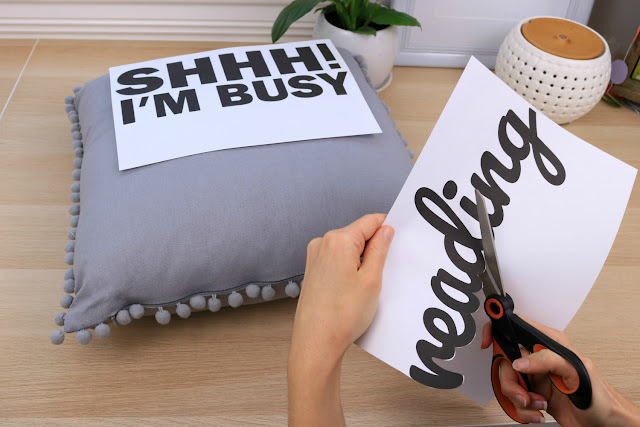 You just need to cut the mending tape to fit your letters (ensuring there's no overhang) and iron over your letters, attaching them to the pillow. When doing this, place a cloth or tea towel on top of your letters and pillow case to ensure you're not damaging the cover with your iron. And when all of your letters are attached, you're good to go! Simply place your pillow insert inside and zip it up! And there you have it! Too easy! What would you put on your pillow/cushion? If you had to choose a pillow to pick your personality/hobbies, what would it have on it?